Joel Embiid scores 24 points to go along with eight rebounds as the 76ers get the win over the Pistons, 116-102. Take a look at the top five plays from Sunday's NBA action. Be sure to check out the Detroit Pistons top 10 plays of the season! Reggie Jackson dishes it to Jon Leuer for the alley-oop dunk. Jon Leuer uses a nifty move in transition to get the lay-in to go. Gainnis Antetokounmpo scores 16 points and grabs 6 rebounds to lead the Bucks to a win over Pistons, 107-103. Avery Bradley scores 18 points and Tobias Harris adds 17 as the Detroit Pistons defeat the Atlanta Hawks 109-87. Ish Smith finds Jon Leuer underneath the basket on a no-look pass for the two-handed finish. Six Detroit players score in the double-digits as the Pistons defeat the Grizzlies 103-90. Detroit snaps a 5-game losing streak as Marcus Morris scores 28 points to lead the Pistons in their 90-89 win over the Nets. Completed his second season in Memphis and third in the NBA with averages of 6.2 points, 3.2 rebounds and 0.4 assists on .492 shooting in 13.1 minutes in 49 games (zero starts)… Set career highs for points per game, rebounds per game, steals per game (0.36), three‐point field goals made (23), three‐point field goals attempted (49) and three‐point field goal percentage (.469)… Shot 23‐of‐49 from beyond the arc after going just 3‐of‐12 from three‐point range in his first two NBA seasons… Posted career highs with 23 points and three blocks with nine rebounds on Dec. 3 vs. Phoenix, becoming the second player in Grizzlies history to post at least 23 points, nine boards and three blocks off the bench (Stromile Swift)… Starting with that game, averaged 15.3 points and 7.2 rebounds on .548 shooting (.550 3FG shooting) in 28.2 minutes over the next nine games from Dec. 3‐18, scoring in the teens or higher eight times and reaching double figures in a career‐high seven‐straight games from Dec. 7‐18… Scored 17 points in a career‐high 32 minutes on Dec. 11 vs. Oklahoma City… Recorded his first career double‐double with 16 points and 12 rebounds on Dec. 9 vs. Orlando… Matched his career high with 23 points in 21 minutes on Jan. 5 at Detroit, giving him the two highest scoring totals by a Grizzlies reserve this season… Led the team or tied for the team lead in scoring four times, rebounding once, steals four times and blocks three times… Scored 10+ points 14 times and 20+ points twice… Grabbed 10+ rebounds once… Recorded one double‐double… DNP (Coach’s Decision) 33 times. 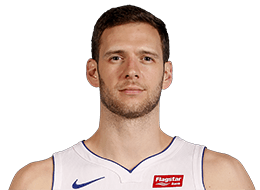 2012-13 (Cleveland/Memphis): Completed his second NBA season with averages of 2.0 points and 1.3 rebounds on .481 shooting in 6.7 minutes in 28 games with the Cleveland Cavaliers and Memphis Grizzlies… Averaged 2.4 points and 1.4 rebounds on .357 shooting in 10.1 minutes in nine games for Cleveland before being traded to Memphis for Marreese Speights, Wayne Ellington, Josh Selby and a 2013 first round draft pick on Jan. 22… Notched 1.8 points and 1.3 rebounds on .625 shooting in 5.1 minutes in 19 games with Memphis… Recorded season highs in scoring (11) and rebounding (5), all coming in the fourth quarter, on April 9 vs. Charlotte in his only double-digit scoring performance of the season… DNP (Coach’s Decision) in 43 games… Inactive 13 games… NBA D-League: Posted 19.5 points, 12.3 rebounds and 1.8 assists on .512 shooting (.467 3FG shooting) in 36.5 minutes in eight games (seven starts) over two assignments with the NBA Development League’s Canton Charge… Scored in double figures in all eight games and reached 20-plus points seven times, including a D-League career-high 28 points on Dec. 14 vs. Springfield… Collected 10-plus rebounds seven times, including a D-League career-high 16 boards on Dec. 14 vs. Springfield and Dec. 15 vs. Iowa… Assigned to Canton from Dec. 8-20 and Jan. 3-7… 2013 Playoffs: Averaged 0.4 points and 0.6 rebounds on .500 shooting in 2.4 minutes in five appearances during the postseason… Made his NBA Playoffs debut on April 20 at LA Clippers in Game 1 of the opening round… Signed a multi-year contract with the Memphis Grizzlies on July 15, 2013. 2011-12 (Milwaukee): Averaged 4.7 points and 2.6 rebounds on .508 shooting in 12.1 minutes in 46 games (12 starts) as a rookie for the Bucks… Scored a career-high 19 points on 9-of-11 shooting in 20 minutes on Jan. 27, 2012 at Chicago. Drafted by the Milwaukee Bucks in the second round (10th overall) of the 2011 NBA Draft on June 23, 2011… Signed a multi-year contract with the Milwaukee Bucks on Dec. 15, 2011… Traded by the Milwaukee Bucks with Jon Brockman, Shaun Livingston and a 2012 first round draft pick to the Houston Rockets for Samuel Dalembert, cash considerations, a 2012 first round draft pick and a future second round draft pick on June 27, 2012… Waived by the Houston Rockets on July 18, 2012… Claimed off waivers by the Cleveland Cavaliers on July 20, 2012… Traded by the Cleveland Cavaliers to the Memphis Grizzlies for Marreese Speights, Wayne Ellington, Josh Selby and a 2013 first round draft pick on Jan. 22, 2013... Traded to the Phoenix Suns in exchange for the draft rights to Andrew Harrison on June 25, 2015.
INTERNATIONAL CAREER: 2011-12 (Germany): Played for Fraport Skyliners Frankfurt during the 2011 offseason, averaging 14.8 points, 7.8 rebounds and 1.1 assists on .495 shooting in 10 games in the German League … Posted 12.0 points and 4.3 rebounds in three EuroCup games. Played four seasons at the University of Wisconsin and averaged 11.2 points, 4.5 rebounds and 1.1 assists on .482 shooting in 123 games for the Badgers… Finished 12th in school history in scoring (1,376 points)… One of eight players in program history with at least 1,300 points and 500 rebounds… Places 10th on the UW all-time ledger in blocks (85)… 2010-11 (Senior): Led Wisconsin with 18.3 points and 7.2 rebounds to go with 1.6 assists on .470 shooting in 34 games… 2011 Associated Press All-American Honorable Mention… 2011 NABC All-District 11 and USBWA All-District 5 selection… His 621 total points were the third-highest single-season total in UW history… Ranked third in the Big Ten in scoring and fifth in rebounding… Guided Wisconsin to the Sweet 16, averaging 20.5 points and 7.0 rebounds in the second and third rounds of the NCAA Tournament… Scored a careerhigh 29 points on Dec. 4, 2010 vs. South Dakota… 2009-10 (Junior): Earned All-Big Ten Honorable Mention after averaging 15.4 points, 5.8 rebounds, 1.6 assists and 1.3 blocks on .522 shooting in 24 games… Ranked ninth in the conference in scoring and rebounding… 2008-09 (Sophomore): Posted 8.8 points and 3.8 rebounds on .466 shooting while playing in all 33 games… 2007-08 (Freshman): Recorded 2.9 points and 1.3 rebounds on .473 shooting in 32 games as a freshman… Connected on 12 of his 26 attempts from three-point range (.462).